A story that revolves around three sisters who live in their grandmother’s home, and the arrival of their thirteen-year-old half-sister. 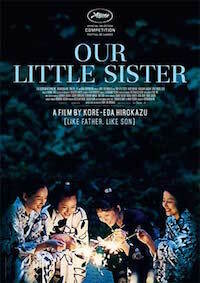 The three sisters Sachi, Yoshino and Chika live together in a large house in the city of Kamakura. When their father absent from the family home for the last 15 years dies, they travel to the countryside for his funeral and meet their shy teenage half-sister. Bonding quickly with the orphaned Suzu, they invite her to live with them. Suzu eagerly agrees, and a new life of joyful discovery begins for the four siblings.